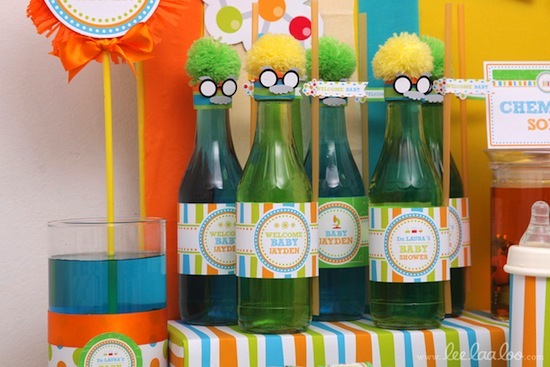 Mad Scientist Baby Shower Ideas that will impress you! 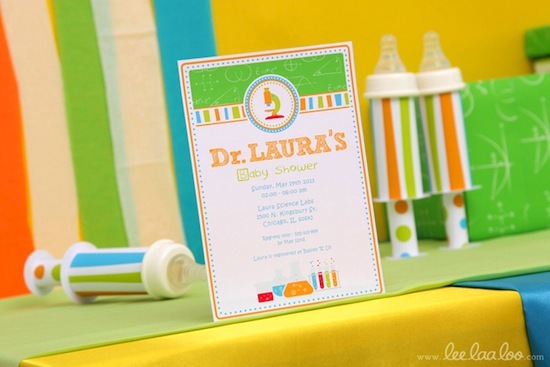 This Mad Scientist Baby Shower is brought to you by Kayla, owner of Lee Laa Loo. 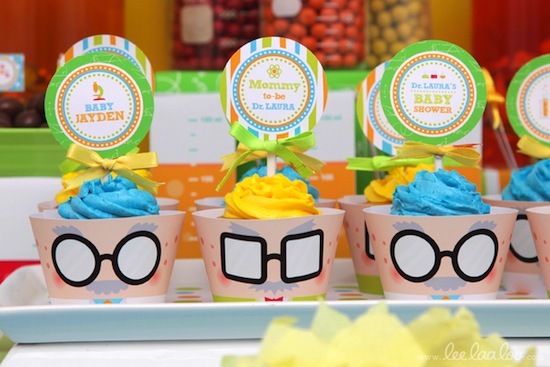 Whether the science lab was your favorite class or not, this baby shower changes the way we look at the “mad scientist”. Decorate drinking cups with your favorite scientist design- think big eye glasses and even bigger, brightly colored fuzzy hair…and don’t forget the mustache . Mix up the colors of the bottle and cute hair. In this case, green and blue glass bottles were used. Green bottles were coordinated with the yellow curly hair while the blue bottles were coordinated with green curly hair. These are definitely the most adorable scientists! Label the drinks and the water with catchy scientific phrases. “Chemical soda” replaces the usual label of “soda” and definitely keeps weary weight and health watchers from over indulging in the sweet, artificial beverages. Instead of labeling water as water, give it its scientific name, “H2O”. The “H2O” has been given an artificial red coloring, with live specimens inside!!!! Specimens are also found in the orange liquid “Chemical soda”. 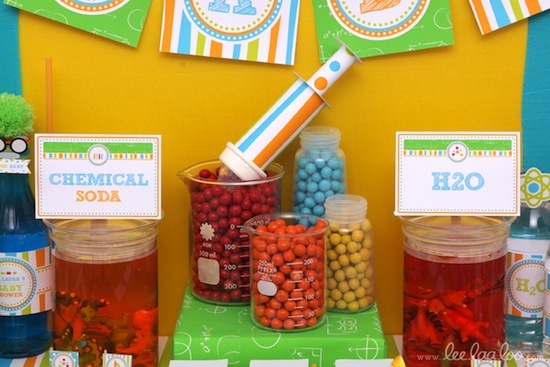 Beakers and medication jars have been filled with tablets of candies. I definitely wouldn’t mind taking these pills! Dessert cups follow the same theme as the drinking cups. Faces are painted on with big eye glasses and a mustache. What’s the colorful hair? The frosting of the cupcakes hidden below! Attached little signs make it easy to take the cupcakes out of the bowls without creating too much of a mess. Other snack boxes include these funnels. 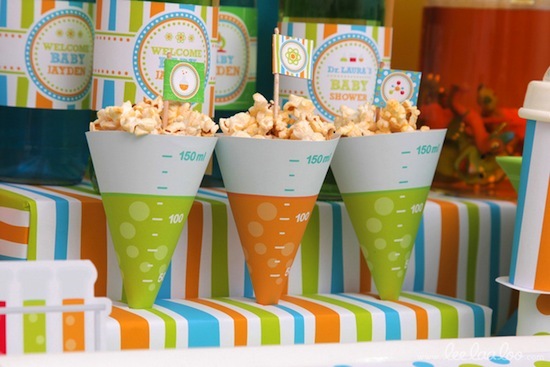 Decide how many mL of popcorn (or any other snack of your choice) you would like with these creative and cute party snack holders. 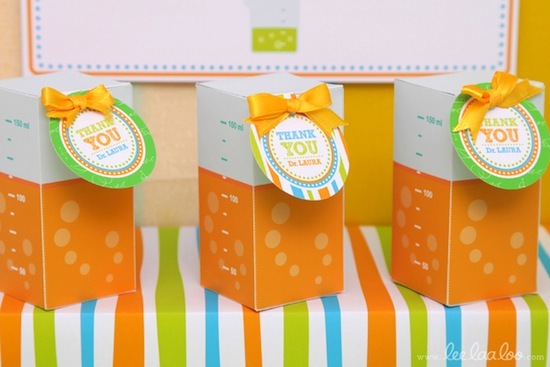 Variations in colors from baby blue, lime green and bright orange keep the science fun and friendly. What are the syringes? Baby bottles with an additional cylinder attached to the bottom. Look at the lime green gift box hiding in the back. Decorate a brightly colored background, like this lime green one, and draw mathematical models and equations! This is one prescription everyone would like to receive! Give the guest goodies galore wrapped up in medication boxes. 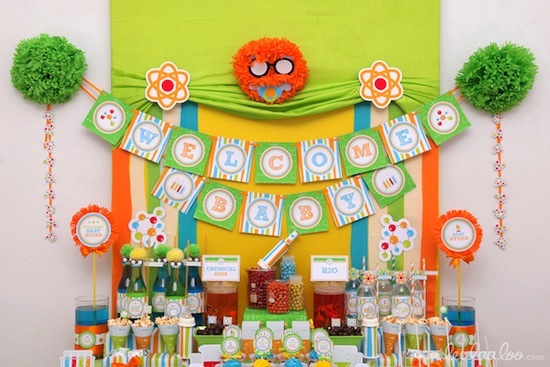 This baby shower definitely changes the traditional association of bitter and sour medications … it is all sweet healing after a visit at this scientist party! From the many dessert tables, grab a specimen or two. 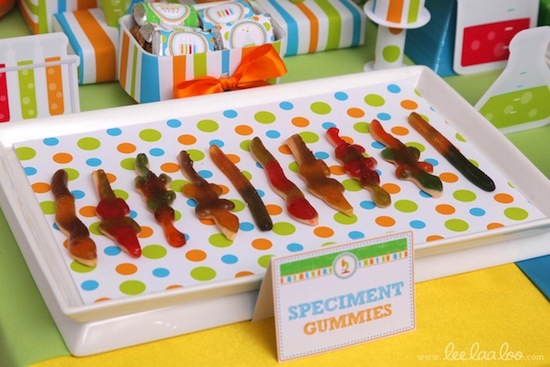 Perform your very own experiment: which flavor gummy worm candy tastes best? Other snack tables included atom cake-pops and chocolate delights. 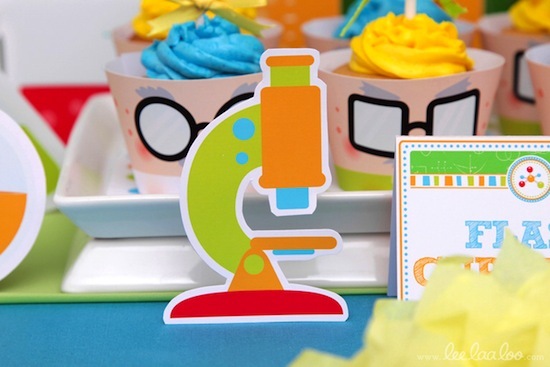 This party also has unique designs by Lee Laa Loo, including an adorable microscope! The crafted banner and signs combine different science aspects with artistic details to make sure this lab room is anything but dull and lifeless.